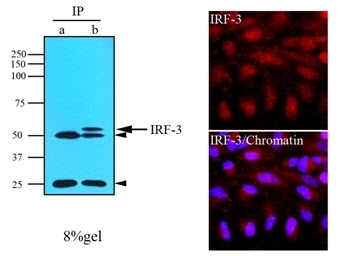 Mouse anti Human IRF3 antibody, clone 3F10 recognizes human interferon regulatory factor 3 (IRF3), a ~55 kDa constitutively expressed member of the IRF family, which acts as vital regulator of gene expression in innate immunity (Nociari et al. 2007). IRF3 accumulates in an inactive form in the cytoplasm and then translocates to the nucleus as a homodimer, following stimuli-induced phosphorylation of specific serine/threonine residues. Association of the homodimer with p300/CBP (CREBB binding protein) forms dsRNA-activated factor 1 (DRAF1), which then activates the transcription of interferon alpha and beta and subsequent downstream interferon-induced genes (Weaver et al. 1998). Recombinant human IRF3 (amino acids 108-166) purified from E. coli. MCA2700 detects a band of approximately 55kDa in HeLa cell lysates. Takahasi, K. et al. (2003) X-ray crystal structure of IRF-3 and its functional implications. Nat Struct Biol. 10 (11): 922-7.